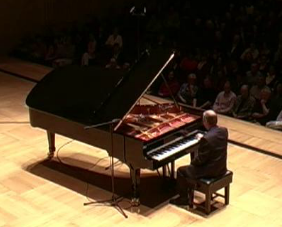 pianist has long been eclipsed by his prolific work as a composer. Appearing at various venues for one-off concerts and functions, his brilliance as an artist has made big impacts. He has played duets with Julian Joseph on BBC Radio 3 and in small combos with Stan Sulzmann, Guy Barker, John Patrick and Roy Williams." "Andy is now dedicating much more time to developing his performing, principally as a soloist, and is playing gigs on a more regular basis. Those who already know his phenomenal technique appreciate that Andy is a true virtuoso in the mould of Art Tatum and Oscar Peterson, and with a stride technique to match. Have a listen to his versions of Giant Steps or Tiger Rag (see below) and you'll get a feel for his style and sheer musical presence. His repertoire features much of the American Songbook, particularly Gershwin, as well as ragtime and bebop and many of his compositions for well known TV programmes, adverts and films. 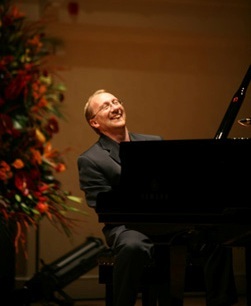 Andy's playing appeals to regular jazz audiences and connoisseurs alike and his concerts are exhilarating, hugely enjoyable and always memorable". From the Oscar nominated film My Architect.